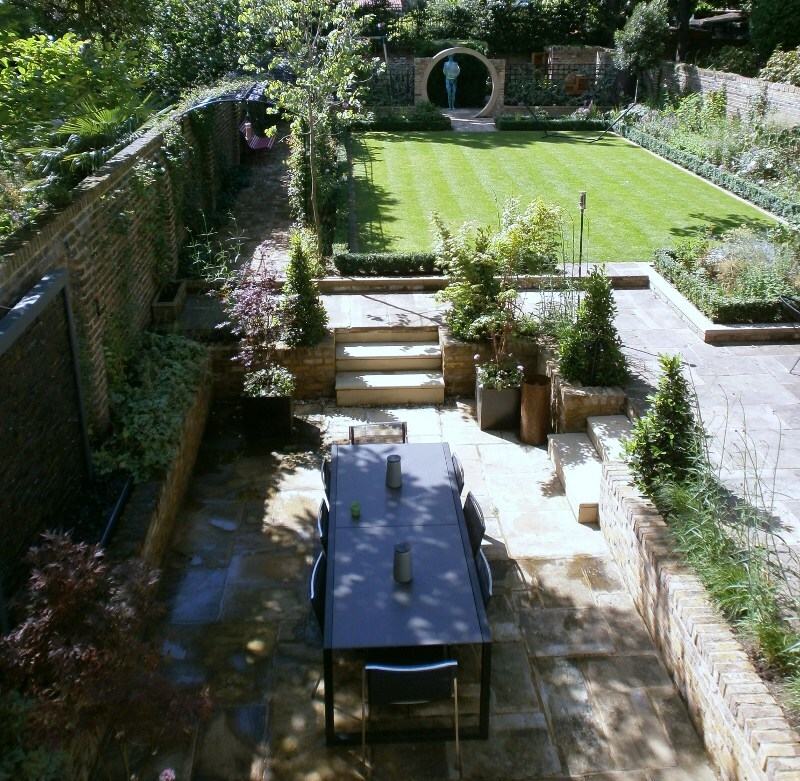 This garden design in Barnes, located in the Castelnau Conservation Area was in desperate need of a re-design. The new garden design was laid out in an asymmetrical style. 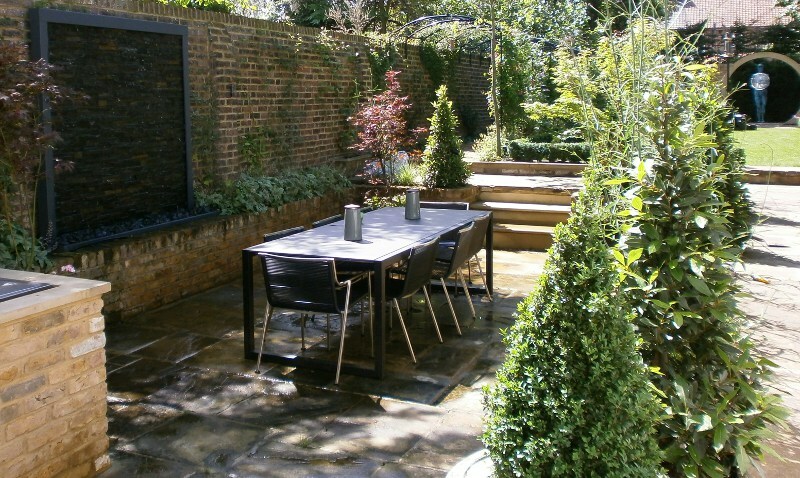 An extended sunken area was created to provide ample space for dinning along with a large water feature wall. A long rose arch leads from both the upper and lower terrace areas along the length of the lawn, providing seasonal interest and fragrance to the garden. Central to this design is the bold Yorkstone moongate. This provides the perfect frame to the fabulous sculpture behind. From this point however two other areas open to a children’s play area and a secluded sofa seating area with fireplace and green walls. With doors leading out from the lower ground floor, a new sunken area was designed and constructed to facilitate seating for 16 – 20, an Egg barbecue and a large wall water feature. The area surrounding the new sunken area is planted with topiary and ornamental grasses which serves as a buffer between hard landscaping and seasonal interest. A stone mason was commissioned to supply this huge 2.4m diameter cut Yorkstone ‘Moongate’. 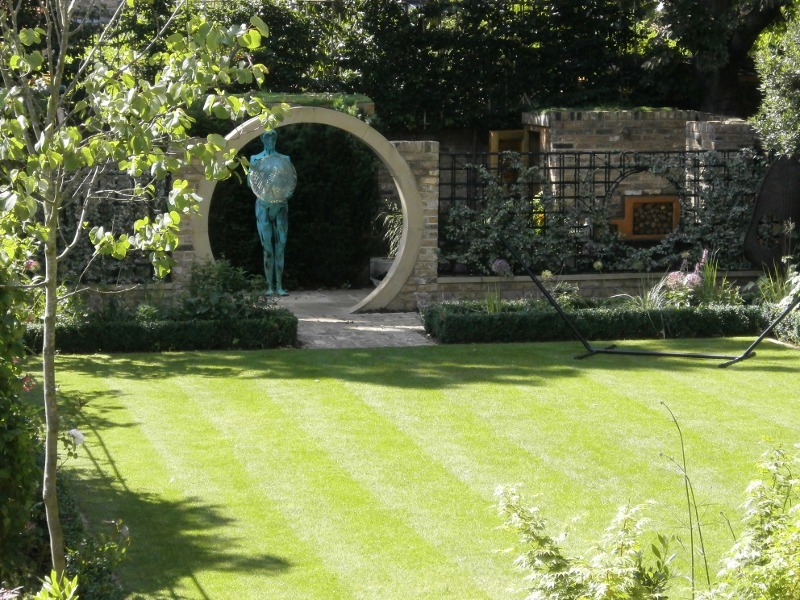 Apart from it looking fabulous it provides the frame for a special piece of sculpture as well as providing the ‘gate’ to the areas beyond. 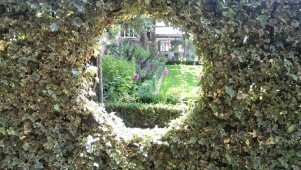 Either side of the Moongate, bespoke steel work was commissioned for climbing plants. Circles were welded into the framework which act as windows into the hidden areas.